So I thought I’d add my input to the survey being run by London Underground on personal safety at Elephant & Castle tube station. Unfortunately I didn’t understand how to use this “Opinionmeter” until I’d already started using it – at which point I had already mistakenly answered the first question. I think the reason I got it wrong is because I expected it to be like a cashpoint (ATM), where the instructional text would appear on the little screen above the numeric keypad. Only in this case the questions and instructional text are on the poster above the machine. Being my usual self and therefore not reading the instructions I pressed the “1” button, because that’s what it said on the screen. A quick fix would be to have an highly visible label on the Opinionmeter itself pointing me towards the text above. I really don’t understand the purpose of the screen at all. I wonder how many other people this has happened to. 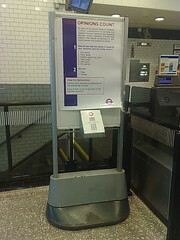 Better still, why not build it in to my ticket machine / Oyster top-up experience? Anonymity guaranteed of course.